Choosing the right cloth diaper is hard enough when there are so many different types of diapers. But it’s even harder when you have to choose among several diapers that are almost exactly the same. Babywearers face a similar problem comparing soft structured carriers, and since my post comparing them has been pretty popular, I thought it was time I offer a solution to the pocket diaper problem too. Plus, more people are becoming familiar with FuzziBunz since the owner appeared on Shark Tank recently. I didn’t see the show, but apparently (and unsurprisingly), she talked a bit (without mentioning names, of course) about the Charlie Banana problem. You can read it all in the owner’s own words here, but in a nutshell, the founder of Charlie Banana had worked with FuzziBunz before she branched off to create Charlie Banana, and although she changed the design slightly, she also used a lot of similar features. There was nothing unethical about it, but it was a big controversy for a while, even to the point that some retailers refused to sell CBs. (Which meant nothing since Target and Walmart were — and are — perfectly happy to sell them.) But what this means for you as a cloth diapering parent is this: choosing between FuzziBunz and Charlie Banana is like choosing between the East Atlanta and the Grant Park farmer’s markets. It’s practically impossible, because they’re practically the same. And as if things weren’t confusing enough when Charlie Banana first came out, FuzziBunz followed up the CB release with a new version of their own (the FuzziBunz Elite) which, intentionally or not, is even more similar to Charlie Banana than the old one-size Fuzzi Bunz were. But there are a few small but key differences that make a choice possible. Maybe. Unless you’re just obsessed with diapers like me, in which case you need to get both. I think the Charlie Banana system is a little easier to adjust, especially since it’s labeled with sizes instead of numbers. (FuzziBunz has a chart that tells you what numbers correspond to what size. Confusing.) But FuzziBunz allows you to adjust both the waist and the legs, while Charlie Banana only allows you to adjust the legs. Also, Fuzzi Bunz has buttons on both sides, which means you can switch the elastic out — and each diaper comes with a spare set of elastic. 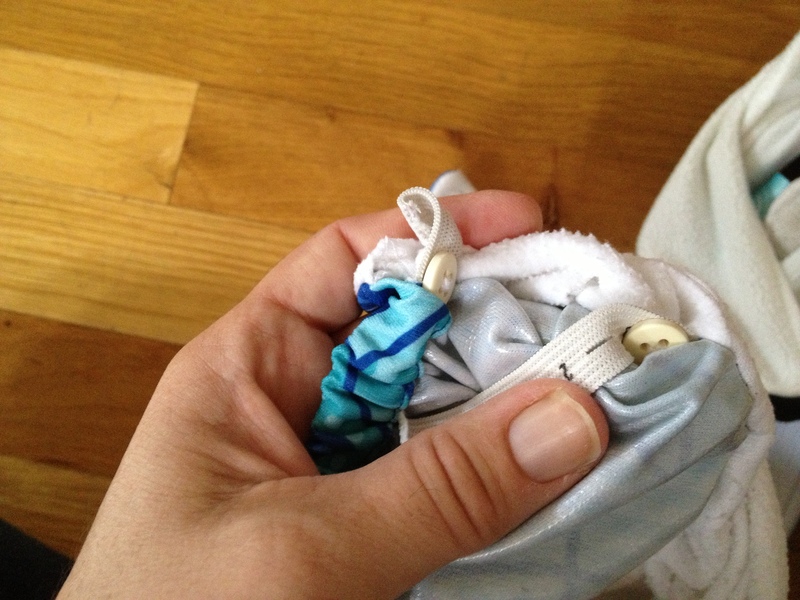 Since elastic is usually the first thing to go on cloth diapers, being able to switch the elastic out easily — no sewing required! — can really extend the life of your diaper. I have a whole pile of old non-adjustable FuzziBunz that I’d be using instead of selling if I could adjust the elastic. So: if convenience is most important to you, then Charlie Banana has a slight edge on elastic. If you want diapers that are built to last, go with FuzziBunz. Both FuzziBunz and Charlie Banana are pocket diapers. This means they have three parts: an outer waterproof layer, an inner layer that wicks moisture away from your baby’s skin, and an absorbent insert that you stuff between the other two layers. Some people don’t like pockets because they’re more expensive than two-part diapers (like prefolds, where you only have to buy a few covers and a bunch of prefolds; with pockets, you need a whole new diaper for every diaper change), but they’re less convenient than all-in-ones (where you don’t have to stuff or fold or adjust anything). But pockets are my favorite type of diaper, because they offer a great combination of convenience and flexibility. Once they’re stuffed, they’re easy to put on (unlike prefolds, which need folding), but they wash and dry faster than all-in-ones, and unlike all-in-ones, you can adjust the absorbency for different needs (like adding inserts for nighttime). There’s one small problem with pockets, though: you’re supposed to take the insert out before you wash them. That means you have to take a dirty insert out of a dirty diaper. So the ease of getting that insert out with as little touching as possible is a big factor when comparing pocket diapers. What this means is that if there’s poop on your FuzziBunz, you can just shake the diaper over your pail and the insert will come out. Whereas with Charlie Banana, you have to reach past the flap to pull the insert out. Some people like the flap because it looks more finished; others prefer the convenience of shaking the insert out. I like both. It’s a matter of taste. 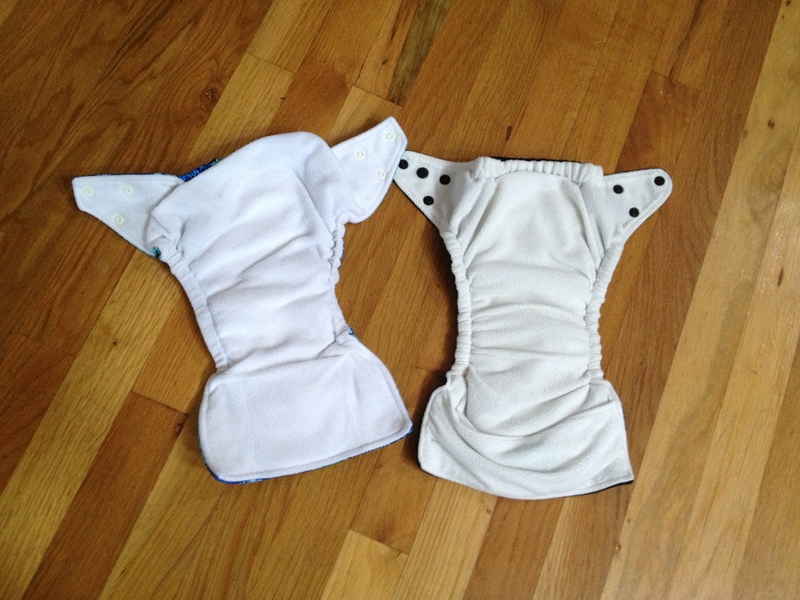 Both diapers use tab snaps, which means they wrap around in front to snap. Both have two rows of snaps, which means the waist and the leg can be adjusted separately. The only real difference in snaps is that Charlie Banana has an extra crossover snap. This is a snap in the middle of the wing that allows you to cross the tabs over each other. It’s great for a small baby (it’s the way you can fit this diaper on a newborn even though you can’t adjust the elastic in the waist), but it’s also great for wrapping the diaper around itself and securing it when it’s dirty and you’re out and you forgot your wet bag. Which of course I never do. But if I did, I’d want a crossover snap. FuzziBunz doesn’t have this feature. The old FuzziBunz inserts are identical to Charlie Banana inserts (except for the big Charlie Banana tag on the latter). Both are microfiber, which means they’re very absorbent and they have to be used inside the diaper (not against the baby’s skin). However, the latest version of FuzziBunz Elite includes a minky insert, which can go directly against the skin. And really, you want to put it on the skin, because it’s so soft. I only have one FuzziBunz Elite diaper, but my four year old digs through the laundry to find this insert so she can carry it around and rub it on her face. It seems like a real waste to stuff it in the pocket, but even though you could use the diaper as a cover and lay the insert on the inside, that’s not really how FuzziBunz are designed. Charlie Banana, however, is designed to be flexible that way — that’s the other reason for the pretty flap over the pocket. 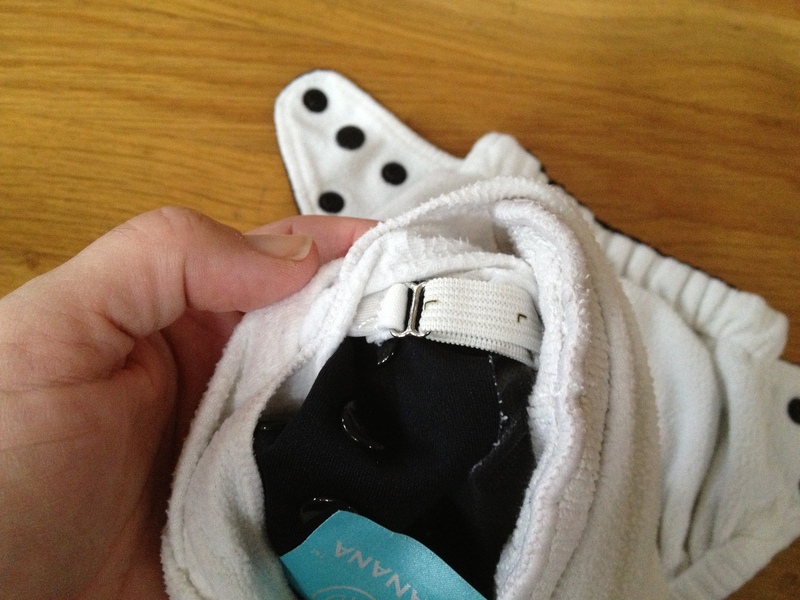 If you want to use the diaper as a cover and put an insert inside, the flap holds the insert in place. And Charlie Banana also offers disposable inserts which are meant to be used against the skin, making it a hybrid diaper. I love the minky insert, although I haven’t really tested it well enough to compare its absorbency to the microfiber. So far it seems to be wearing better than a microfiber insert, but that may be just because I don’t use it very often. It’s one of my two favorite diapers, so I’m always saving it for special occasions. I honestly can hardly tell a difference in fit between the two diapers. Both are trim and snug and look great. The biggest difference to me is the colors and the prints, which of course are just a matter of opinion. Charlie Banana has some fabulous colors (I’m a sucker for black and orange diapers), but I hate the prints (although plenty of people love them). FuzziBunz has similar colors, and they regularly offer limited-edition prints, which I almost always love. So for me, FuzziBunz has a slight advantage here. The verdict? They’re both awesome. You need both. Lots of both. They mix and match well. 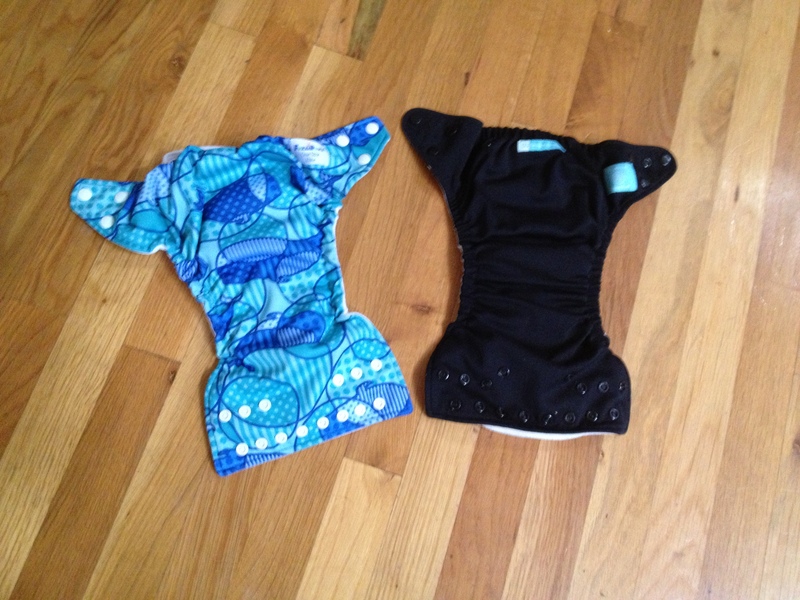 Atlanta diaper service now offers AIOs and pockets! I would like to add that I purchased 2 6 pack one size diapers from Charlie banana through target sept 2012, started using this past week and do not recommend at all. Their buckle design is defective literally in one day. The buckle slides into the diaper itself rendering the sizing system useless. I wrote to customer service and waiting for reply. I only read bad responses from customer service not holding up to their warranty on this issue. I have read that they stopped using the button strap due to infringement and it seems this may be true if owner came from fuzzibunz. what to do with diapers after im done with them? my kids are older now, but the diapers are in great condition. hey Sandra, you can resell them! I used to sell all mine on diaperjunction, but there are a bunch of cloth diaper trading sites…and you can try Facebook marketplace or craigslist, too.